Nippon Maru: Japan comes to Brooklyn. Brooklyn was part of the round-the-world itinerary for Mitsui O.S.K. 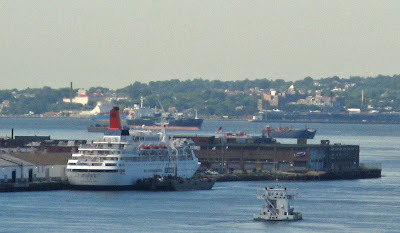 Lines' 21,903 GRT cruise ship Nippon Maru, shown here docked at Red Hook on June 11. Could her visit have been timed to coincide with the Brooklyn Museum's exhibit, Utagawa: Masters of the Japanese Print, 1770-1900, or even Murakami? A baseball diatribe, wherein, sadly, I will offend several friends. I'm sick and tired of the 2008 Mets. And I'm sick and tired of being sick and tired. I wouldn't feel this way if they'd have shown themselves to be feckless bozos from the git-go. I'd be in a funk, for sure, but it would be a simmering funk from which I could easily be diverted by something like a good book or a blues concert. What I hate is the recurrent cycle of raised and dashed hopes. Roller coasters can be fun, but I want off this one. So, what's to be done? With respect to the Mets themselves, and Tim Marchman to the contrary notwithstanding, firing the manager isn't going to do the trick. Indeed, at least in the short run, I think it's likely to make matters worse. What about going up the food chain and canning Minaya? He's been around long enough to bear the blame for some of the team's current problems, but I suspect they run deeper than anything for which his removal would be a solution. Minaya got a rep in Montreal for producing overacheiving teams on a tight budget; the Mets are big budget underacheivers. Perhaps the luxury of having some money to throw around made him lose some of his edge. But he's a smart guy and likely to regain it. Firing the Wilpons isn't an option, unless someone can put together enough bucks to convince them to sell. It's hard to imagine, though, a new owner that wouldn't be worse. Most likely, it would be some entertainment-oriented conglomerate that would be clueless about baseball but unwilling to let people who know the game run the show. In short, I don't see any magic bullet solution to the Mets' woes. They are, I suspect, rooted in a team culture that's been developing for twenty two years, since the Mets last won a World Series, and after which the owners, perhaps responding to other owners' entreaties to hold the line on salaries, let some important players from that championship team go to free agency. Is there such a thing as the Curse of Ray Knight? Seeing no short-term solutions to the Mets' problems, what am I to do? I could simply decide to ignore baseball for the rest of this season. It's tempting--there are lots of other attractive uses for the time I spend tearing out what little hair I have left every time Reyes makes some goofball error, either with his glove or on the basepath; Delgado grounds into a double play with one out, runners on first and third and the other team up by one in the eighth; Heilman takes the mound in the eighth with a two run lead and leaves down by one; or Perez has a Dark Night of the Soul and gets yanked in the third after notching his ERA up two more percentage points. But, there's something potentially very exciting going on in the baseball world this year. Actually, a couple of things. The Tampa Bay Rays, after ten years of expansion team frustration (nine lasts and one fourth place finish in the AL East) are in a duel with the Red Sox for first place in their division. I consider Tampa my "hometown", having lived there from the second half of sixth grade through college. Nevertheless, there are a couple of obstacles to my rooting for the Rays. One is that it would upset my household, as my wife is a Red Sox fan. The other is that I find it very difficult to support any American League team, though I've made an exception for the Red Sox, at least when they're not playing the Mets, and especially when they're playing the Yankees. So, on to the other thing. This really appeals to the history buff side of me. There's a team, an NL team to boot, that hasn't won a Series championship since 1908--exactly a century ago, that now holds a solid division lead. I mean, of course, the Cubbies. I could root for a team that hasn't won it all since the administration of William Howard Taft. Also, I have weaknesses for: Frango mints, "dragged through the garden" hot dogs, the fiction of Saul Bellow, the art of Manierre Dawson, the architecture of Louis H. Sullivan (Boston's gift to Chicago), the blues, and Wilco. A little fling with the Northsiders might fit nicely. In addition, the Cubs have as their skipper my Tampa homeboy, and a true gentleman, Sweet Lou. So, sorry, Arch. I still think the Cards are the team I would love best if my love were granted on purely aesthetic grounds, despite the diversion from the true faith of little ball during the unfortunate Mark McGwire era. And I know how y'all just loathe the Cubs. Sorry, August; I'll always have a soft spot for the O's stemming from the first regular season major league game I attended, in which Boog Powell proved the decisive factor with a late inning two run homer against the Yanks. Sorry, too, Twiffer, and Dearest Wife. Though if it does come down to a Cubs vs. Red Sox series, I'll keep very quiet. Mostly, sorry to all the loyal Mets fans (including Homer Fink and Joe Martini) for what I promise is a temporary apostasy. I have confidence that, in the long run, the Mets will solve their problems. Of course, in time, they'll develop a whole new set, but that's how the game goes. Just for now, though, "Ya gotta believe!" rings hollow for me, and I must avert my eyes. Update: Joe Martini (see comments) takes heart from yesterday's fifteenth inning triumph over the Diamondbacks, a team whose number the Mets seem to have had for some time (despite the previous night's especially dispiriting loss). This may well energize the Mets enough to crank out a few more wins, perhaps even bring them a notch above .500, but it'll be like a sucker rally on Wall Street before the next vertiginous drop. Joe, who also admits to a period of Cubs fandom, and was at Shea for the black cat game in 1969 (though by then I presume he was rooting for the Mets, whose route to their first championship was smoothed by a Cubs collapse), concludes with: "Look... I rooted for my team when they lost 120 games. This is easy." Yeah, well, I could have rooted happily for the 1962 Mets, a gaggle of no-hope misfits and losers and a few grizzled veterans, skippered by a lovable old baseball legend who knew how to make lemonade from a lemon by doing tummy medicine commercials with the Mets' blooper reel in the background. What annoys me to distraction about this year's Mets (actually, it's been going on for several seasons) is their ability to rouse hopes, then smash them like cheap china. The Cubs may end up doing the same--if they do, it will be characteristic of them--but then the Red Sox had a similar pattern going into the 2004 season. Steven Goldman has some encouraging words in today's New York Sun. Another wretched Mets season, he thinks, may be just what the doctor ordered. Fuller's ESB, with a short discourse on the history of malt liquor. This is yet another post inspired by Twiffer, who, in commenting on my post about Alice Feiring and anti-Parkerism, bemoaned the unavailability of his favorite brew, Fuller's ESB (more about what those initials stand for below) in stores in the Washington, D.C. area. My suggestion to Twiff is that he direct his complaint to the British Embassy, who will no doubt see fit to lodge a protest, and may even be willing to share with him some of the case or two a month I'm sure they get by diplomatic pouch. Anyway, Twiff's paean to this ale led me to want to give it a try--oddly, I'd never had it. Luck was with me yesterday as my wife, my daughter and Kei Andersen accompanied me to the Atlantic Chip Shop for dinner, and ESB was on tap there. I did not suffer buyer's regret. Lately, my taste has run to assertively hoppy IPAs like Dogfish Head. With ESB, by contrast, it's the malt that announces itself first, a caramel-y caress to the middle of the tongue, like a flourish of woodwinds, before the hops hit the back, a soft swell of strings in a minor key. It was a balance that worked nicely with the Granny Smith, walnut and Stilton salad we shared as a starter, and the bangers and mash I had for my entrée. On this side, you'll sometimes see ESB called "Extra Special Bitter", but if you're in Britain and ask for that, the person tending bar is likely to give you a quizzical look. Over there it's usually just "ESB", but if you ask anyone what that stands for, you'll be told, "Extra Strong Bitter". (Update: Judging by the number of hits on this post from England off web searches for "ESB stands for what?" or similar, I'm convinced "anyone" is far from a safe bet.) Using "strong" as an adjective in a trade name or advertising for any alcoholic beverage in the U.S. would be a major no-no. Laws and regulations here provide that alcoholic content, as a percentage or "proof", must be printed on every label, but nothing else may be said by way of puffery, e.g. "kicks like a mule" or "two shots of this and your troubles are over". MAN ON LEFT: Nice round of golf. LEFT: What's that you're drinking? RIGHT: It's Country Club malt liquor. RIGHT: Yes. It's less bitter, with less filling carbonation, and it has more [here the man on the right picks up the stubby can and slams it down on the glass for emphasis] AUTHORITY [translation: it has more ALCOHOL] than beer. LEFT: Hmmm, I'll have to give that a try. So it was that malt liquor (by law, any fermented malt beverage above a certain percentage of alcohol by volume--the threshold varies from state to state--may not be called "beer" or "ale", but must be called "malt liquor") was first marketed as a beverage of choice for white, upper middle class men. Then some genius did some market research and found out who was really buying the stuff; as the saying goes, the rest is history (and bye-bye eight ounce cans). Thanks to adclassix for the clip.